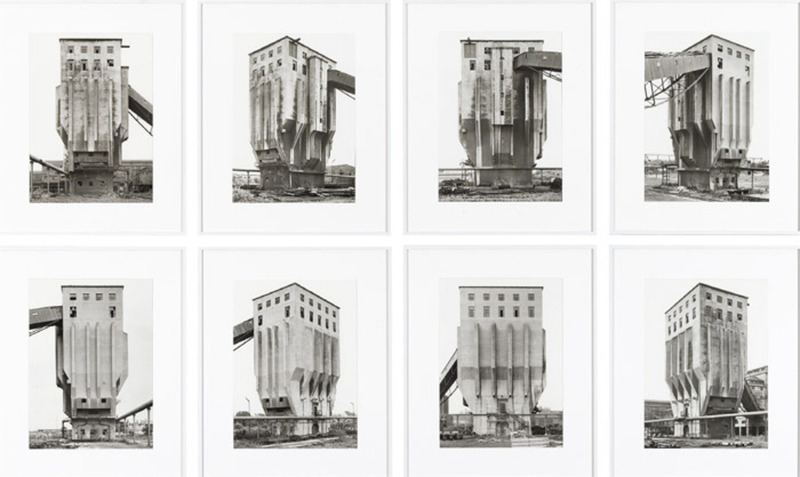 Bernd and Hilla Becher, Coal Bunker: Zeche Hannibal, Bochum, D. 1973, 2012, eight framed gelatin silver prints, overall 37 1/4 x 75 1/2". The photographic enterprise of Bernd and Hilla Becher is by now as seemingly archetypal as the structures it documents. Recording, over several decades, a range of building “typologies” around the globefrom water towers to grain elevatorstheir images offer up a kind of anonymous, parallel history of the industrial edifice. The same inexorably milky sky frames each structure, and atmospheric indicators are so minimal as to compel concentration upon the objects themselves. This is not to say that the eye isn’t tempted by minutiaethe erratic arc of tire tracks, cement planters bearing shrubs, and parked cars that suggest a distinctly human absence.